Princess Lalla Hasna of Morocco (Arabic: الأميرة لالة حسناء‎‎, born 19 November 1967 in Rabat) is the youngest daughter of King Hassan II and his second wife, Lalla Latifa Hammou. She is sister to the current king, Mohammed VI and Prince Moulay Rachid. She was educated at the Royal College (Rabat). Since her childhood, Princess Hasna has been interested in social and cultural activities, with special emphasis to environmental issues in Morocco. In 1999 she launched the national campaign for the protection of the environment and gave the prize for the most beautiful and cleanest beach in Morocco. 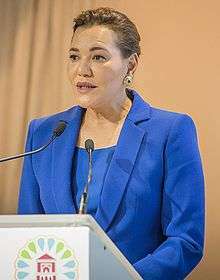 To shore up her work, the Mohammed VI Foundation for the protection of the environment was created in 2001 and chaired by Princess Hasna. She presides over the governing board of the foundation and regularly pays on the terrain visits to sensitize the population about environmental issues. In 2002, Princess Lalla Hasna set up the prize of young reporters for the environment and in 2003 a prize for photography annually awarded on the international environment day. She is Honorary President of the Hassanate Association for Human Development. Lalla Oumaima Benharbit (born 15 December 1995). Lalla Oulaya Benharbit (born 20 October 1997). National League of Female Civil and Semi-Civil Servants. Moroccan Association for the Aid of Sick Children (AMAEM). Muhammad VI Foundation for Environmental Protection. Moroccan Archaeology and Patrimony Association (SMAP). Dame Grand Cordon of the Order of the Throne. Dame Grand Cross of the Royal Order of Isabella the Catholic (Kingdom of Spain, 22 September 1989). Dame Grand Cross of the Order of Leopold II (Kingdom of Belgium, 5 October 2004). Dame Grand Cross of the Order of the Aztec Eagle (United Mexican States, 11 February 2005). 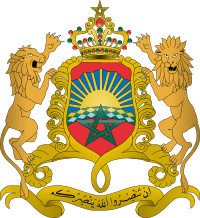 ↑ "Morocco celebrates birthday of Princess Lalla Hasna on Friday". 18 November 2010.